There's a gem hidden in the Middle Georgia golf community. This course is the most enjoyable in the Warner Roins, Greater Macon area. 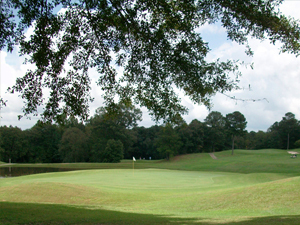 Located 13 miles east of Interstate 75 and just west of the Ocmulgee River on Highway 96, you will find the Waterford -- the finest 18 hole Middle Georgia golf course. Our golf course lies among rolling hills, lightly wooded landscapes and the beautiful atmosphere of Middle Georgia. This Middle Georgia golf course was designed by famed golf course architect Don Cottle. This course is built to challenge experienced golfers while at the same time helping rookie players learn the game. This course is difficult and relaxing all at once. In addition to the high quality of the course, you will find one of the friendliest staffs in the nation. We pride ourselves on welcoming all new comers to the Central Georgia golf community. We want you to leave your round of golf feeling welcome and appreciated at our course. When you come play the Waterford Golf Club, you will thoroughly enjoy our professionally serviced facilities. We feature a quality Pro Shop with an assortment of the latest golf gear. We even have a delicious restaurant for you golfers who want to grab a bite before or after your exciting round of golf. If you have been wanting to perfect a part of your golf technique, come practice on our driving range with one of our golf pro's. Our golf course has an eager staff that is committed to providing you with customer service that will make your golf visit remarkable. A favorite course among Warner Robins golf lovers! We proudly feature several membership and golf lesson packages to best suit your needs and budget. So what are you waiting for? Give us a call and come take a guided tour of our facility. Contact our Pro Shop for all the details and benefits to our golf lessons and memberships. We can't wait to see you on our course!